54 / the tasting panel / march 2014 IN THE BIZ B adoit rises naturally sparkling from its source in Saint Galmier. Its natural efferves- cence is just one of the qualities making France's iconic sparkling bottled water the new star in restaurant dining rooms and kitchens coast to coast. With Badoit now ﬁrmly entrenched in the U.S. marketplace, The Danone Group, Badoit's parent company, is ramping up its educational platform. First, there was the addition of Los Angeles chef Timothy Hollingsworth to work with the on-premise community in major markets, mainly L.A., New York and Miami, to preach Badoit's unique qualities—ﬁne bubbles, luxurious mouthfeel and a hint of miner- ality—as the perfect accompaniment to a restaurant's multi-course meals. Now, with the introduction to the U.S. of its Global Brand Ambassador, famed Chef Thierry Marx, of the Michelin-starred Sur Mesure par Thierry Marx in the Mandarin Oriental Paris, Badoit has in place a team that can not only educate on the pairing advan- tage that Badoit presents with ﬁnished dishes, but also—and perhaps most important for chefs—the beneﬁts of using Badoit in the kitchen. Marx, who has acted as Badoit's Global Brand Ambassador for the last three years, has been cooking with Badoit since he won their Rising Star Award ten years ago. "Water is probably the most-used food product in the kitchen," says Marx, who feels it's just as important to know a water's qualities, and how they interact in a dish, as it is any other ingredient. "All waters complement the cooking process based on their unique chemical features," he adds, "Badoit is rich in bicarbonates, which helps reduce cooking time for vegetables [thereby retaining more nutrients], and makes for ﬂakier crusts in pastry." 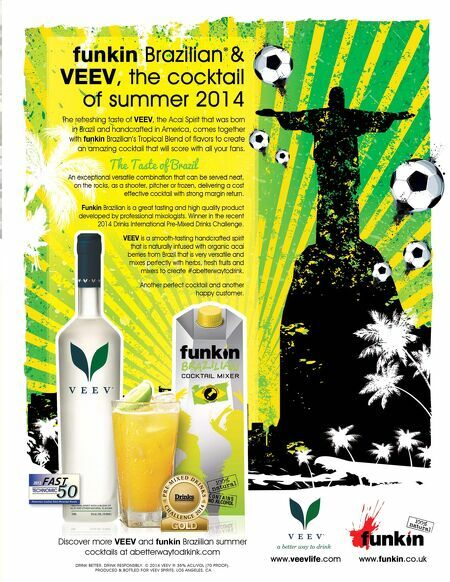 "We are thrilled to be working with Chef Marx," says Olga Osminkina-Jones, Vice President of Marketing for Badoit. "His light-hearted approach to cooking has helped make cuisine less stuffy, and his uncompromising attention to detail, including which water to use in a particular type of dish, is a perfect ﬁt for Badoit and its message of quality both in, and out, of the kitchen." 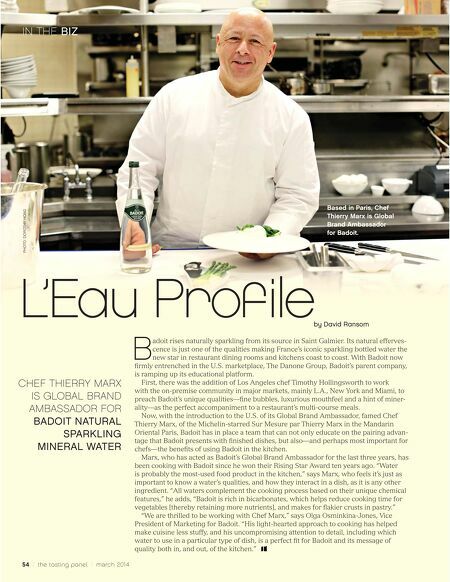 PHOTO: DOROTHY HONG L'Eau Proﬁle CHEF THIERRY MARX IS GLOBAL BRAND AMBASSADOR FOR BADOIT NATURAL SPARKLING MINERAL WATER by David Ransom Based in Paris, Chef Thierry Marx is Global Brand Ambassador for Badoit.